The item Secrets of New Forest Academy, (ebook) represents a specific, individual, material embodiment of a distinct intellectual or artistic creation found in Charlotte Mecklenburg Library. Now more than ever, Spencer, Daisy, and even Dez must fight to save schools everywhere. Toxites, the small creatures that love to feed on the brain waves of students, are just the beginning of their troubles. The Bureau of Educational Maintenance (BEM) is after Spencer, and the Rebels hope to sneak him to safety within the walls of an elite private school. But danger follows Spencer and his friends, testing their loyalty and trust as well as their Toxite-fighting skills. 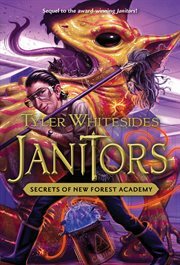 Can they hold out long enough to discover the true secret of New Forest Academy and what it means to the future of education?